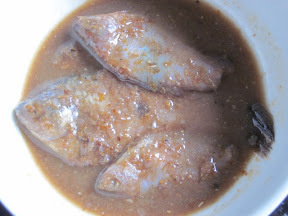 Before Fish Sauce and Shrimp Paste could reach the rural area or distance provinces, the salty sauce that people used in salting their food is salt and this Pla-Ra. This Salty fermented fish is a kind of preservation that we use as the sauce for salting, for example in Green Papaya Salad. In North-eastern dishes there is the need of Pla-Ra and in my opinion we can hardly do without it. From the fish pieces or the fish meat we make chili sauce to eat with other vegetables. Pla-ra is made when we caught many sweet water fish in rainy season, using salt made from salty underground water. First we clean the fish, then marinate them in a lot of salt and wash them again and add more salt mixed with the roasted grained and closed them in the jar. It takes more than half a year for the fish to be properly fermented. Not only the Northern and Northeastern people know how to make Pla-Ra. The People from central provinces also make Pla-Ra from the fish found in their areas, which is bigger fish and they make drier Pla-Ra (having less liquid) than the one we have in the Northeast.